The 1933 V129 Hockey set is an anonymous issue from the Depression era. It was released during the 1933-34 season. Though assigned a V-series designation because it shares design elements with other Canadian-issued caramel cards from the era, it has been speculated that this may have been a tobacco issue. One of the legendary cards in this set is an intentional short print that was meant to keep collectors coming back in order to find the elusive card. 1933 V129 Hockey card fronts feature a black-and-white player photo. A white border appears around the card. The player's name is listed in the border area underneath the picture. The backs have a card number and identify the player's name. Vital stats and a short biography follow in both English and French. There are 50 cards in the set, but only 49 are required to complete it. 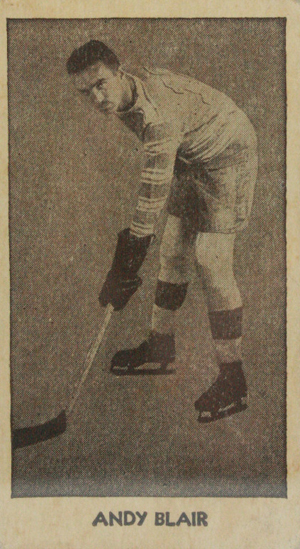 The key card in 1933 V129 Hockey is card number 39, which shows Harry Oliver. In order to make it harder to complete the set, his card was deliberately short printed. As a result, the set is considered to be virtually complete without him. That said, the cards are among the toughest of all vintage hockey sets and will take a long time to complete in any form. Besides the Oliver short print, key cards in 1933 V129 Hockey include Howie Morenz, Eddie Shore, Charlie Conacher and King Clancy. 50 cards, although a set without the Oliver short print is considered complete.